At the 2017 Plastics Night event, students and professionals from the local upstate New York plastics industry had the opportunity to network and discuss research projects underway at RIT. RIT graduate student Shalomin Thomas discussed her research into adhesives for photonics applications with several interested RIT students. 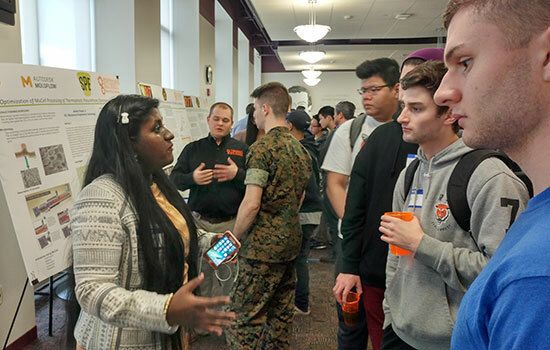 Rochester Institute of Technology will host Plastics Night from 5:30 to 7:30 p.m. on April 19 in the McGowan Commons in RIT’s College of Applied Science and Technology. This is the second year of programming to highlight the latest research in plastics engineering—from materials and design to processing. Some of the current applications for plastics and polymer engineering technology include health care, food services and transportation. RIT’s faculty and student researchers will present research on a variety of topics including advanced composites, 3D printing, self-healing polymers, bioplastics and nanotechnology. Participants will also be able to tour the Plastics Lab and the AMPrint Center as well as interact with plastics industry professionals. “Attendees will find themselves immersed in a learning experience that is often behind-the-scenes of human progress. Plastics, quite literally, enables our technology, packaging and many structures to exist,” said Samuel Lum, fourth-year mechanical engineering technology student and vice president of RIT’s student chapter of the Society of Plastics Engineers. The event is free and open to campus and the general public. More than 200 members of the professional and student chapters of the Society of Plastics Engineers are expected at the event that will include undergraduate and graduate student research projects and tours of the various labs in RIT’s College of Applied Science and Technology.